those who died in service of their country. Armed Forces Day honors those who are presently serving. On November 11th, 1918, an armistice was signed ending hostilities, in effect ending World War I. In 1919, President Woodrow Wilson proclaimed November 11th the first commemoration of Armistice Day, honoring veterans of WWI. 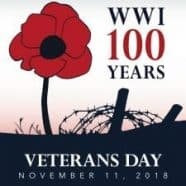 In 1954, when WWI “the war to end all wars”, had been followed by WWII and Korea, Congress changed Armistice Day to Veterans Day to honor all vets, not just those from WWI. Intelegist, LLC says thank you, to all of our American Veterans. And thanks to Mark Mullarky of Mullarky Business Systems, where this post first appeared.